* Total number of reviews and star-ratings are based on data collected during the time period Kustom Heating & Cooling has been using the ReviewBuzz system and may not directly match the data found on each public review site. RE: Jon R. - Kustom Heating & Cooling - 4/17/2019: Jon did an excellent job of annual A/C checkup & also patching up some cool air leakage areas around pvc pipe fitting for evap coil. Also did Dryer Vent cleanout as an extra service, but he proved that it was needed by taking pictures of area. Great job - Thank you!. Jake M was on time, polite and very knowledgeable. It was a pleasure working with him. If we need service in the future, I will request Jake. Thank you Kustom and Jeremy for the outstanding work! As always - I impressed with how thorough Jeremy was! Jeff and Corey did a great job on our recent install. They were very neat and everything looked good when they were done. Jon R serviced my furnace today. He was great. Explained everything to me and before he left asked if I had any questions or concerned. He was very professional and courteous. Thanks you Jon. Jeremy and Chris did a great job getting my boiler back up and running. I am very pleased! On behalf of our dear friend, Katherine S: Your service was outstanding! Your men were so nice to our dear friend and she could not say enough nice things about Kustom. Thank you! Fast response, very professional, extremely knowledgeable and thorough. Jake took the time to explain the problem to us so we understood it. Thanks!! Jake was very efficient and explained the work he was doing thoroughly. We appreciated his suggestions especially the surge protector that he installed for us. Even though we chose Kustom due to history of old friendships. We continue to look to you because of the service level your technicians deliver. Thank You for the excellent service! We just had a new furnace installed by Jeff at Custom Heating and are very pleased with the overall installation and service. Jeff and his assistant were very knowledgeable and courteous. He made sure everything was set up to our preferences and walked us through all the features of the system. This company was recommended by our son who has been using them for many years. We have also become a very satisfied customer. Both Jeff and Corey did an outstanding job in replacing my furnace and AC unit. They were efficient, courteous and neat and finished within the 6-8 hour time frame mentioned before they started.. When they completed the job, they explained everything relating to use, programming and maintenance of the new furnace and AC unit. Overall rating of A . Adrian G.
Jeff K and Corey D were on time and got right to work. They did the job faster then expected. Jeff was very diligent in explaining all the features and readily answer all my questions. Both of them were very meticulous about clean up. Would recommend these two to anyone. We had a new furnace and AC installed by Jeff K. and Corey D. from Kustom Heating and Cooling 2/8/2019 and I can tell you that the Service Technicians mentioned were outstanding. They removed the old furnace and AC and installed a new furnace and AC . We were informed about the progress and time line of completion during the installation. They also reviewed and told us about questions we had during the installation. Both Jeff and Corey were very professional and knowledgeable during the whole process. Jeff instructed us on how the system worked and how to program our new thermostat at the completion of the job. He also reviewed all of the paper work and answered all of our questions. What a great company and Service Techs. Very honest!!! We called Kustom Heating and in about 1/2 hour Jake was at our door. He was very efficient and very thorough. He found the problem with our furnace and fixed it. He thenproceeded to explain everything to us and finished up . We are very pleased with the service and with Jake, he did an excellent job. We will definitely call Kustom Heating should we need help again. 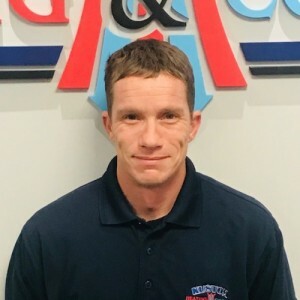 Jake M is a Service Pro from Kustom Heating and Cooling. He came out for a service call within 2 hours of our phone call to Kustom. We were having problems with our furnace overheating. He did an evaluation of our system and fixed the problem within a short amount of time. He was very professional and answered all of our questions regarding the repairs and follow up recommendations. Outstanding service . Would recommend Jake M and Kustom anytime. Jake was very professional and knowledgeable I was very Satisfied with the work he provided for Our Furnace This was Our first experience with this Company and we are Happy. Jake drove in the worst snow of the season, trudged up and down our unshoveled driveway, several times as the job required, and with a smile and great attitude took care of our heater. We were impressed and grateful, and our dog loved him, too. Jeff K. and Corey O. installed a furnace, air conditioner, Ecobee4 thermostat and humidifier for us on January 17, 2019. They arrived on time, very friendly and polite. They started by laying tarp in all locations they would be walking through our house. The installs all look great and work great. They called and gave me a 30 minute heads up so I could come home from work and learn about all of our new equipment. Jeff explained everything thoroughly, collected payment and were on their way. They were extremely neat and clean throughout this entire install. I highly recommend Kustom Heating & Cooling. Thank you guys for always taking good care of us! Customer service is always a top priority at Kustom Heating & Cooling. Our BBB Membership A+ rating is like a badge of honor as we continuously strive to provide the best experience for our clients.